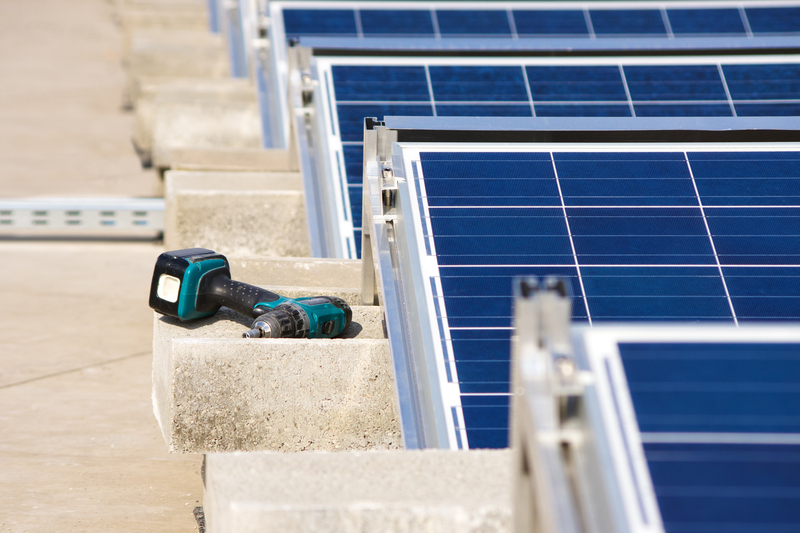 What Is a Solar Ballast? If you’ve looked into installing solar, you may have realized that your installation won’t be easy on your roof. The majority of solar mounts are attached directly to a home’s rafters, which means cutting into the roof. While installers generally take care to seal and flash holes to prevent leaks and water damage, those incisions could eventually cause a real problem, especially if you have a low-sloped or flat roof. Or maybe you just don’t like the idea of some installer cutting holes in your roof. That’s where a ballasted installation comes in. 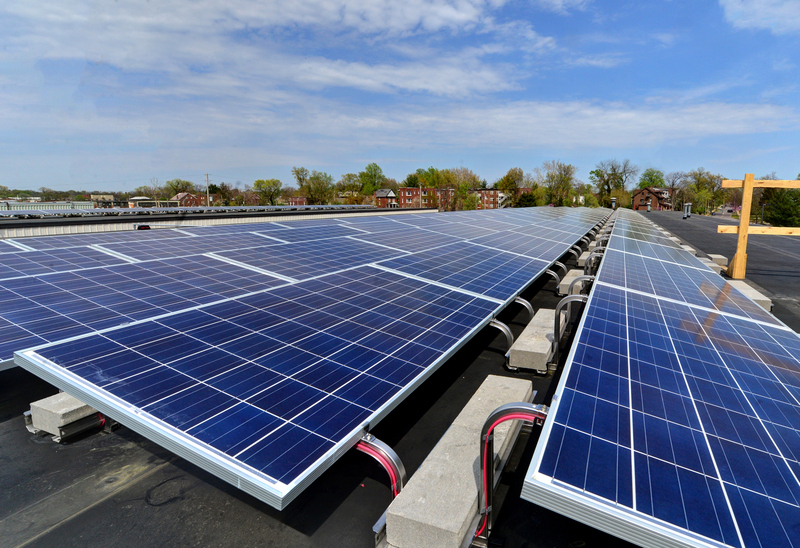 A ballasted mount offers all the benefits of solar panels without the impact to your roof. That’s because solar ballasts aren’t attached to roof rafters the way most solar panel installations are. Instead, they sit directly on top, cemented to the surface with concrete blocks. In fact, even if you decide to go for a more traditional installation, your installer may recommend that you have some concrete ballasts placed on certain parts of the racking. This adds weight to your system and prevents it from blowing off in high winds. Generally, it’s best to follow the advice of your solar contractor when assessing whether or not your system needs ballasts. However, knowing your options never hurts, so here’s a brief overview of ballasts—both the pros and the cons. That way, you’ll come to your installer armed with more solar smarts than ever. Builders design many flat and low-sloped roofs essentially like shallow pools with a complex drainage system. That means even a small leak on a flat roof presents a huge problem. Without the assistance of gravity, all the runoff flows directly into your home, damaging your ceiling and walls—not to mention the property you have inside. Installers often recommend solar ballasts for roofs like these, where a few incisions might make a big difference between clean and dry or soggy and moldy. As a bonus, these kinds of installations usually mean that your solar contractor won’t have to work back and forth with a roofer, which can add time to your installation from the administrative burden of working with two teams. Furthermore, it means you won’t have to worry about problems with your roof warranty—an even greater argument in their favor. A hybrid system—one that’s attached to your rafters but still uses ballasts in some places—may be useful for preventing problems with wind lifts. You can think about it like a paper weight: the heft of the cement blocks keeps the mounting equipment in place, even when the wind blows. In general, only a licensed structural professional engineer (also known as a P.E.) should make the determination to use ballasts, though. Cement obviously adds weight to your roof, and some surfaces might not be able to handle that additional load. Meanwhile, wind tunnels operate differently in different locations—so additional ballasts shouldn’t be added without a P.E.’s blessing. Speaking of P.E.s, always make sure your solar installer has one on their team—or at least coordinates with a consultant P.E. when designing your system. Each roof and solar energy system has its own unique considerations. A professional engineer can evaluate the size of your system, orientation, climate, roof load, and the strength of your racking equipment to determine what kind of ballasts are needed. That all means running some pretty sophisticated equations, as well as an understanding the physics of wind movement. Talk to your installer about how they enlist P.E.s to assist with mounting design in their installations—before you sign off on a contract. Unfortunately, concrete isn’t impermeable to the effects of harsh weather. Thawing and freezing can eventually cause concrete ballasts to crumble, particularly if your installer didn’t use anything stronger than landscaping pavers to ballast your system. Meanwhile, in other parts of the country, UV exposure can also degrade low-quality ballasts. In fact, many contractors will use nothing more than common masonry blocks, the kind that can be bought from a home improvement store. That means they’re not going to hold up forever. Obviously, a broken-down ballast isn’t doing its job, so you might be more vulnerable to wind lifts and other problems if this occurs. For this reason, it’s a good idea to have your system inspected regularly, particularly before the winter weather starts in. Additionally, you can avoid problems with ballasts from the get-go by checking that your installer is using the best quality materials. Ballasts should be made with products that are freeze-thaw resistant. These are made from cement that contains aggregates like chlorides, which can lower the freezing point of the blocks, preventing scaling and cracking. All in all, no matter what kind of mounting system you choose, you’ll see much better results if you choose an installer who knows what they’re doing. Try to talk to at least three different contractors before you go with one company over another, and read the fine print on any warranties or guarantees from your installer. The more you know about your installation, the better off you’ll be!